In anticipation of the new MARVEL's The Avengers: Age of Ultron movie coming to theaters on May 1st, I decided to create a free printable Avengers bingo game for you to play!! My daughter loves The Avengers, and has been having so much fun playing this bingo and seeing all her favorite superheroes!! 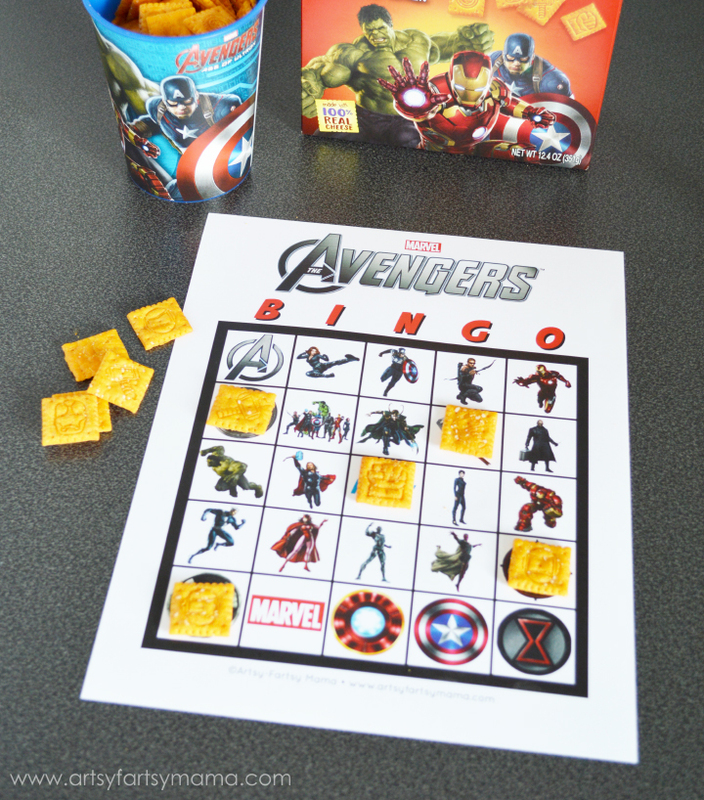 The Avengers bingo includes the entire Avengers team, Loki, and a few new characters and villains from MARVEL's The Avengers: Age of Ultron!! For the markers, we decided to use The Avengers Cheez-It baked snack crackers for more Avengers fun (and a tasty snack after)! In case you have more than 8 people playing, or just want to let the kids make their own cards, I've created a blank bingo card set. All you need to do is cut out the 24 bingo images and glue them in place with a glue stick. 1. Pick some kind of object to mark your squares or use a dry erase marker. 3. As you pass items on the road, call it out or have each child mark it as they see it. Each player will cover that item on their card with a marker. Once a player has 5 squares covered in a row (horizontally, vertically, or diagonally), they call out "BINGO!" and win the game! To lengthen the life of the prints, I would recommend printing the Bingo cards and calling pieces on cardstock and laminating or putting in a plastic page. All files are 8.5x11 inches and put together in a single PDF format. Well that is a fun way to use the Cheese-its! Thanks for a fun printable- my kids will love this! My son just has to dig out all of the Iron Man crackers because he loves them so much. I'll have to print this out and play this with him. Thanks for sharing! Looks like fun - thanks for sharing! I am happy that I found your post about the best bingo sites while searching for informative posts. It is really informative and quality of the content is extraordinary. I love this! What a great way to build excitement for the new movie! Thank you for sharing at the Talented Tuesday Link Party!